Despite being a 13 time WWE/WWF world champion, Triple H has never had nearly the same success outside of the wrestling business that his old rivals The Rock and Steve Austin have achieved. And when you are behind Steve Austin in your film career, you have not accomplished the level of success necessary to be a supporting villain in The Expendables. 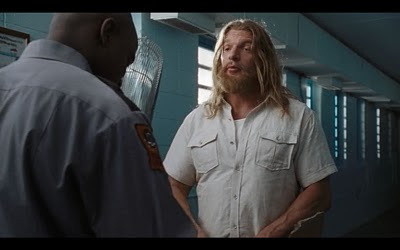 Before this year, Triple H's non-wrestling work consisted of a handful of TV appearances basically playing himself, and one supporting villain role in Blade: Trinity. That changed in 2011, as WWE films, the production company that gave us such classics as The Marine, gave Triple H the starring role in a family comedy/all-ages heist movie The Chaperone. Pretty well sums things up. Ray "Ray Ray" Bradstone (Triple H) is a convict trying to turn his life around. He does this by shaving his wacky lumberjack beard, calling a self-help radio show on a near constant basis, and through a series of awkward attempts to reconnect with his ex-wife and daughter (Modern Family's Ariel Winter). Shockingly enough, he is not immediately forgiven. Ray struggles to adapt to life on the outside, as the omnipresence of organic pizza restaurants and hybrid cars keep him from getting a job as a pizza maker or mechanic. He is approached multiple times by the guy who got him in prison, the somewhat incompetent Phil (The Departed's Kevin Corrigan). Phil tries numerous times to get Ray to agree to one last job, despite nearly being punched through a wall and having his car stolen. Ray is apparently the only guy who can be trusted to drive a car for reasons that are never explained. Maybe this is just a Grand Theft Auto game and Ray is the player? Triple H smuggled cigarettes in his beard while on the inside. Anyway, in an hilarious scheduling mixup, Ray agrees to help rob a bank at the same time as his daughter's field trip to New Orleans, after he had verbally committed to chaperone. He takes the criminals to the bank, but then abandons them, even throwing the keys in the grass for no reason to show up on his daughter's bus. But before the bus leaves, the criminals leave the bank, and after eventually noticing there is no driver, they flee on foot. In a bizarre coincidence that doesn't make a whole lot of sense, the man carrying all the money stumbles over the bags being loaded into the nearby bus, drops his bag, and then runs off with nothing. That is not how these things are supposed to work! Phil and another member of his group see Ray on the bus, somehow discover that the money is on the bus, and assume that Ray is an evil mastermind who is trying to set them up and get away with their money. 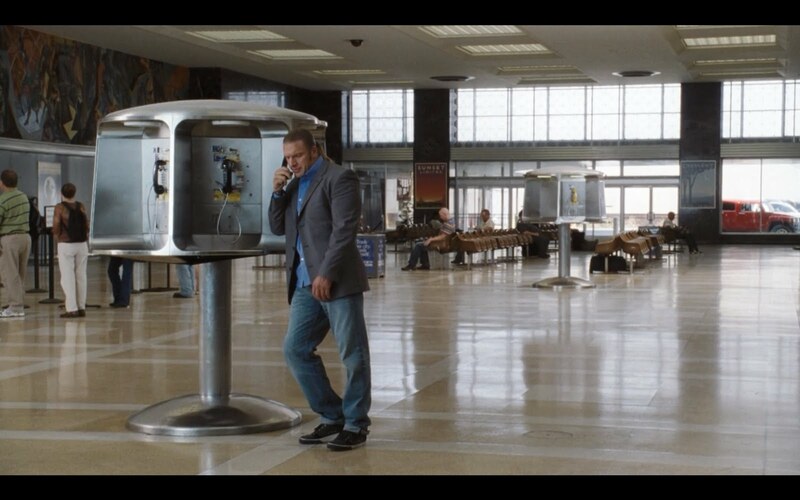 I'm pretty sure most people weren't using pay phones in 2003. It's a really far-fetched conceit to get to the actual story, but it's actually not too bad from there on out. Yeardley Smith (Lisa Simpson) plays an overworked administrator, Enrico Colantoni (Veronica Mars' dad, also from Just Shoot Me for losers like Nick who never watched Veronica Mars) plays Ray's romantic rival. Ariel Winter does a pretty good job of not being too grating with a part that is about 75% whining. Triple H is stiff but he's only groan-worthy on a couple of occasions where he has to silence the children by growling out what's basically a wrestling promo. Kids love the Point Break references. September is Wrestler Month but we might as well call it Hostage Month, as it seems it is impossible for a movie to star a wrestler and not see at least one friend/loved one taken hostage. Last week it was John Cena's hot wife, before that it was the 3 Ninjas having both a friend and girlfriend kidnapped. Here, the daughter predictably gets kidnapped by Corrigan, in an attempt to set up an exchange for the money. If I were Triple H I'd get a DNA test. Where's her beak nose and giant biceps? Granted, I'm not saying The Chaperone is good. Even once we're past the ridiculous first act, we still have a couple of annoying teen actors given way too much agency as they are inspired to help this strange man they just met. There's a couple of groan-worthy moments that make it seem like I am watching the version of the movie that will one day air on ABC Family 2, like when Corrigan's stolen car crashes into the back of a diaper truck and diapers fall out onto his car. Because if diaper trucks existed, they would probably just be full of loose diapers. But there is some humor, past the Disney Channel-ish made up trucks and kids outwitting adults. 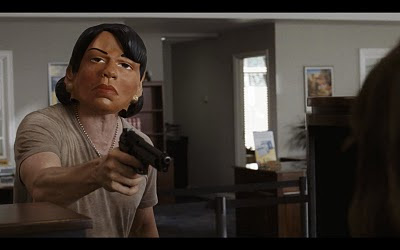 A bank teller is truly puzzled why someone would wear a Condoleezza Rice mask and then get mad when someone calls him out on it. Yeardley Smith is genuinely funny as Triple H's chaperone foil, as when she struggles to come up with reasons why you never tell children to "shut up" even when you need them to shut up. Triple H trying (and failing) to outwit the goofy bus driver that may as well be named Otto. There are entertaining scenes, but they're held together by a really worn-out plot. Perhaps more depressing than the talented supporting cast having nothing better to do is the fact that the director, Stephen Herek, is a real director who has done some excellent (no pun intended) work in the past, including Bill and Ted's Excellent Adventure, The Mighty Ducks, and Mr. Holland's Opus. The Chaperone is certainly worlds ahead of 3 Ninjas: HNAMM, but compared to Herek's previous work, it's still forgettable at best. 2.2 World Championships out of 5. Bank Teller (to Condy Rice): So... you didn't intend to be funny? Miss Miller: We don't ever tell our children to "shut up." Even when they misbehave and act like brats. Miss Miller: Do you know the definition of "lawsuit?"